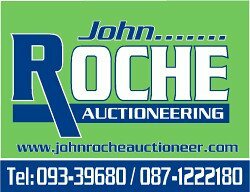 Business Name: John Roche Auctioneering As a professional real estate agent, customers can receive an in depth knowledge of all the aspects of living and re-locating to Ireland and the west regions, and most of all, what to expect when buying or renting a new property here. We are pleased to offer this partially completed bungalow situated in the heart of the countryside. The property can be completed or can be acquired as is. Please telephone our office for more details. The house is situated on .5 acre site. We are pleased to offer this .5 acre with site potential. This site is located within walking distance of Ballinlough, County Roscommon. The property is in a quiet location with good rural views. Please contact our office for further details.